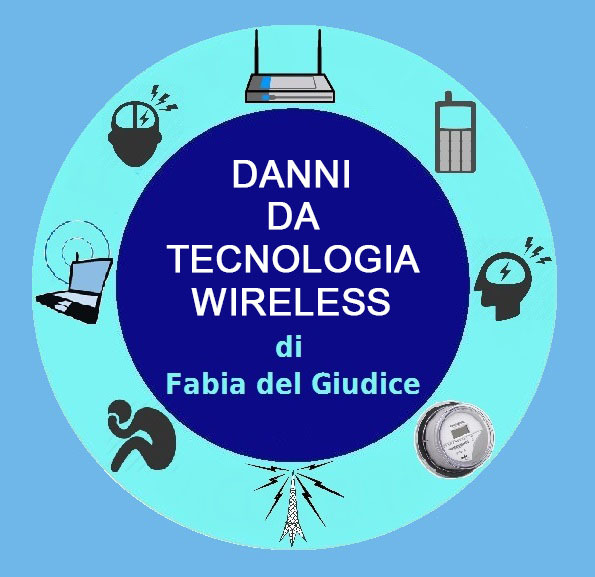 [Cos’altro serve per convincere che i telefoni cellulari (e la tecnologia Wireless in generale) fanno male alla salute? Cell phones emit microwave radio-frequency radiation. Fact. This radiation has the ability to penetrate our bodies. Fact. Our governments do virtually nothing to protect us from these dangers. Fact. And yet there is strong evidence, multiple peer reviewed studies, to indicate that cell phones cause cancer and other diseases. Take a look for yourself at these facts. But first let’s just consider what cancer is. 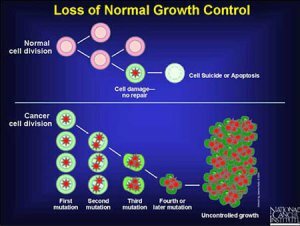 So cancer typically involves abnormal cell division and DNA damage and in some cases cells may form a mass of tissue called a tumor. In the studies done to date cell phone radiation exposures are principally linked to two types of brain tumor, gliomas and acoustic neuromas. Gliomas, a type of tumor that starts in the brain or spine are typically malignant. Gliomas are particularly deadly. Most people survive only 1 to 3 years after diagnosis. Acoustic neuromas though non-malignant (low-grade cancer), are in many cases life threatening given that they are an intracranial tumor. Source: Table 2 INTERPHONE Study Group. Brain tumour risk in relation to mobile telephone use: results of the INTERPHONE international case-control study. Int J Epidemiol (2010); 39(3):675-694. 3. Tumor Risk on Cell Phone Side of Head: Again from the Interphone Study – currently the big daddy of cell phone radiation studies it being the largest and longest study on the link between cell phones and brain tumors – it also found, “tumors were more likely to occur on the side of the head most used for calling”. 5. Increased Risk For Glioma and Acoustic Neuroma: the studies performed by the Hardell Research Group are widely regarded as being amongst the best. 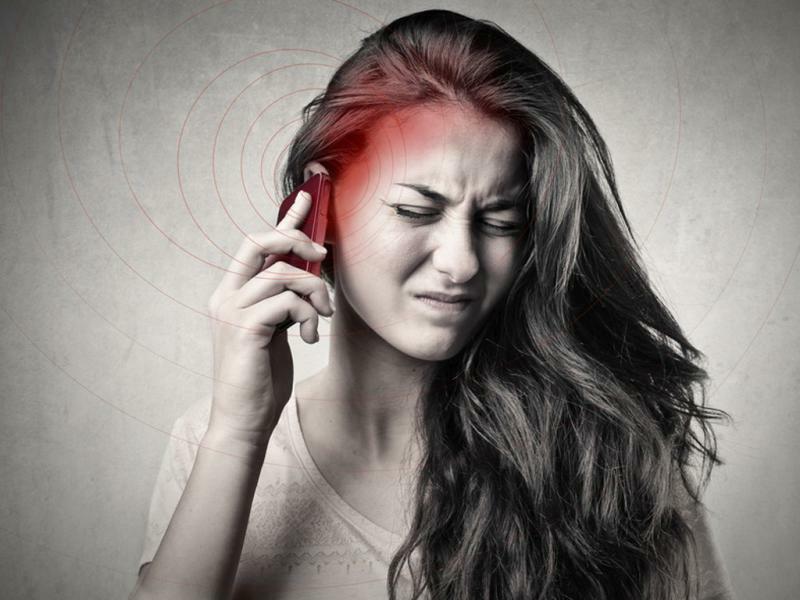 This recent study finds, “A consistent pattern of increased risk for glioma and acoustic neuroma associated with use of wireless phones.” These findings are consistent with their earlier studies. 6. Temporal Lobe & Glioma Risk: A recent French study found evidence of an increased risk of glioma and temporal lobe tumors. The study found that, “risks were higher for gliomas, temporal tumours, occupational and urban mobile phone use. “. 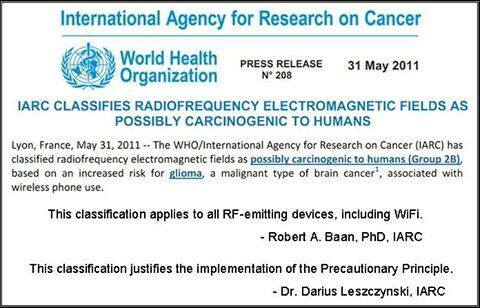 According to EMF watchdog Powerwatch this is an important paper, “that confirms existing studies and which should help move the IARC RF evaluation strongly towards a Group 2A – ‘probable human carcinogen’“. 9. Brain Tumor Risk is Higher on ‘Cell Phone’ Side of Head: A research paper that reviewed 11 studies found, “a link between prolonged cell phone usage and the development of an ipsilateral [same side of head as cell phone] brain tumor”. 10. Meningioma: This Swedish study looked at adult brain tumor cases diagnosed over a two year period. 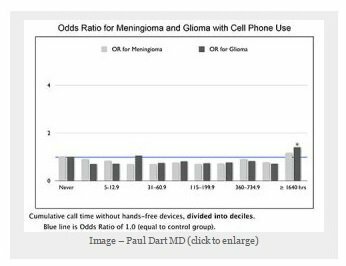 Although the study concluded that, “no conclusive evidence of an association between use of mobile and cordless phones and meningioma was found“. The studies authors did say, “an indication of increased risk was seen in the group with highest cumulative use“. 11. Malignant Brain Tumors: Recent work by Hardell looked at long-term use of mobile and cordless phones. In conclusion it was found that, “this study confirmed previous results of an association between mobile and cordless phone use and malignant brain tumours. These findings provide support for the hypothesis that RF-EMFs play a role both in the initiation and promotion stages of carcinogenesis“. “the risk of cancer of the pituitary gland more was more than twice as high among women who used a cell phone for less than five years as compared to never users“. 13. Thyroid Cancer: The thyroid gland is situated in the neck. Using a cell phone against your ear exposes your thyroid to cell phone radiation. A recent Israeli study observing that, “the incidence of thyroid cancer has been on the rise in Israel for more than a decade which matches the rise in the use of cellphones” collected human thyroid cells from healthy patients and subjected them to radiation. The study found, “evidence of changes in thyroid cells in response to electromagnetic radiation”. 14. Melanoma Risk: Melanoma is a cancer that starts in a certain type of skin cell. 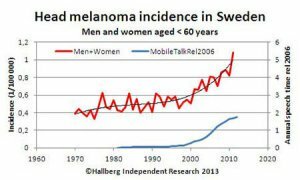 A Swedish study found “a very clear association between increasing use of mobile phones and increasing rates of head melanoma [ ] in Nordic countries“. 15. Stem Cell Cancer: In a controversial US study on 29 cases of neuroepithelial tumors, cell phone users accounted for 11 of them. These initial results indicated a near tripling in the risk of neuroepithelial tumors through cell phone use. 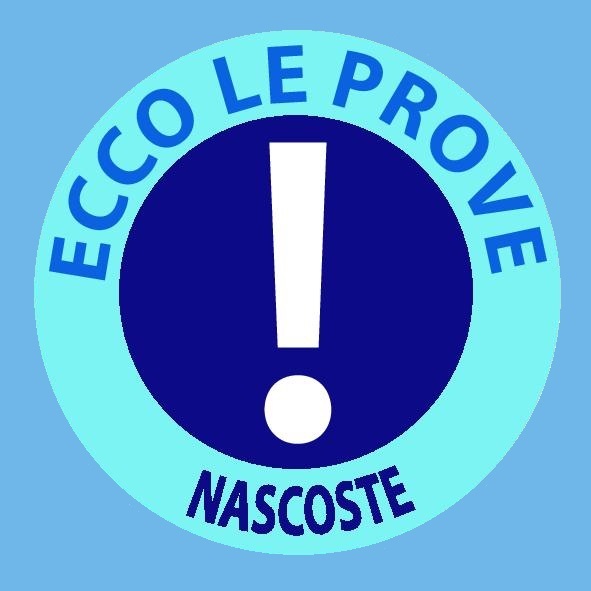 The published results were revised to reflect a doubling of risk and then reported as not ‘statistically significant’. 16. 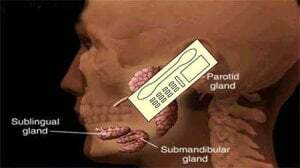 Oral Cancer: An Israeli study on 460 cases of parotid gland tumors found, “based on the largest number of benign PGT patients reported to date, our results suggest an association between cellular phone use and PGTs [parotid gland tumors].” The parotid is the salivary gland near the cheek where many users hold their cell phone. 17. Parotid Malignant Tumors: Another Israeli study analyzed deaths as recorded on the National Cancer Registry over a 36 year period found, “the total number of parotid gland cancers in Israel increased 4-fold from 1970 to 2006 , whereas other major salivary gland cancers remained stable“. 18. Leukaemia: A comprehensive review of over a dozen studies including studies on exposures from cell tower radiation, TV and Radio broadcast towers concluded, “cancer, especially brain tumour and leukaemia, but all other cancers also“. 19. Lymph Node Cancer: In an Australian study one hundred mice were exposed to RF radiation for two 30-minute periods per day for up to 18 months. The authors called the increased incidence of lymphoma “highly significant”. They added that “it is very unlikely that the faster onset of cancer was due to chance“. 20. 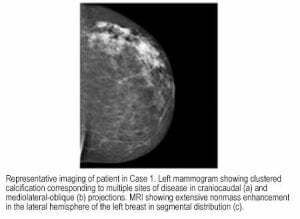 Multifocal Breast Cancer: American researchers studied four young women with breast cancer. They found that, “all patients regularly carried their smartphones directly against their breasts in their brassieres for up to 10 hours a day, for several years, and developed tumors in areas of their breasts immediately underlying the phones“. 21. Eye Cancer: A German Study has established a link between uveal melanoma and cell phone radiation and similar exposures. 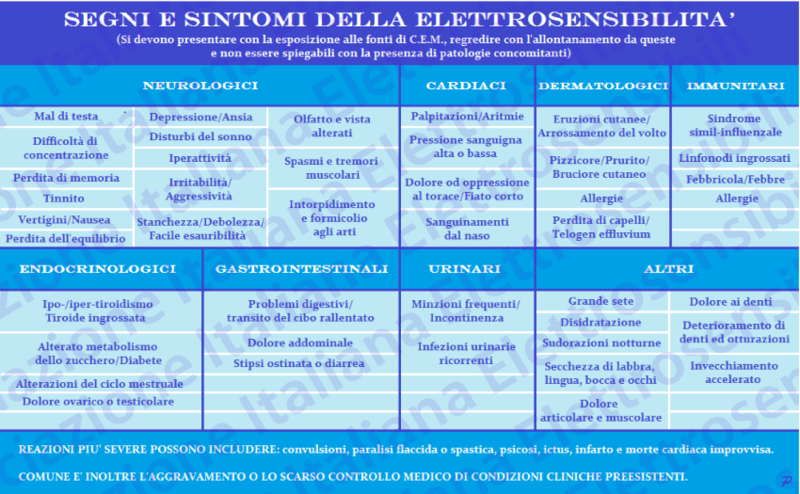 The study “found an elevated risk for exposure to radiofrequency-transmitting devices“. Another study found ocular symptoms and sensations in long term users of mobile phones. 22. Diverse Cancerous Tumors: A Brazilian Study established a direct link between various cancer deaths such as tumors in the prostate, breast, lung, kidneys and liver in Brazil’s third largest city, and cell phone tower radiation exposures. 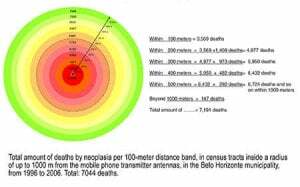 The study found that, “more than 81 percent of people who die in Belo Horizonte by specific types of cancer live less than 500 meters away from the 300 identified cell phone antennas in the city“. This same study also lists more than a dozen other research papers that have found a link between different cancers and cell phone/cell tower radiation exposures. 24. Brain Cancer Incidence Increases Over Time (U.S): another U.S. study of brain cancer incidence trends in relation to cell phone use in the United States found, “there was a statistically significant increasing trend between 1992 and 2006 among females but not among males.The recent trend in 20–29-year-old women was driven by a rising incidence of frontal lobe cancers“. 25. Brain Cancer Incidence Increases Over Time (Europe): Studies carried out in Norway, Finland and the U.K. have identified a similar trend of an increase in the incidence of brain cancer over time. 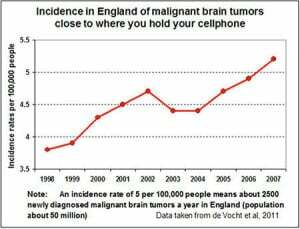 In the UK study the incidence of malignant brain tumors close to where you hold your phone was highlighted. Source: Mobile Phone Use and Cancer Risk – Research on a Group 2B Carcinogen. Joel M. Moskowitz Ph.D.
26. Blood-Brain Barrier (BBB) Permeability: The BBB is a membrane which prevents toxic materials from the blood from entering the brain. It was first discovered in 1975 that RF radiation causes the BBB to leak, since then at least a dozen laboratories around the world have corroborated this effect. There’s no consensus on the link between BBB damage and cancer but some studies elude to this. 27. Brain Cell Loss: A Turkish study on adult female rats that were exposed to a 900 MHz electromagnetic field found that, “EMF exposure caused a significant decrease of the…….cell number…… additionally, cell loss can be seen……“. In their conclusions the researchers drew parallels between these exposures and teenagers’ brains that are exposed to cell phone radiation. 29. 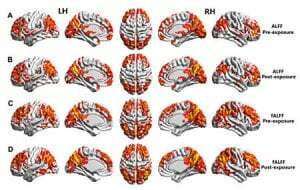 Brain Blood Flow Affected: This Finnish brain imaging study found that “that the EMF emitted by a commercial mobile phone affects rCBF [regional cerebral blood flow] in humans“. 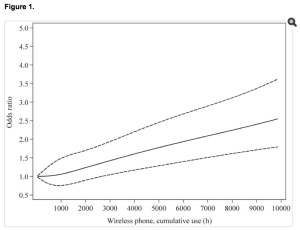 This suggests that cell phone radiation affects neuronal activity. 30. Texting Affects Memory: An Australian study on young adolescents found “students who reported making or receiving more voice or SMS calls per week, and in particular more of both, demonstrated shorter response times on learning tasks, but less accurate working memory”. One way cancer and other diseases are believed to develop is when the DNA (genetic information) in a cell becomes damaged. This damage mutates the DNA. There are many studies linking cell phone radiation exposures to different types of DNA damage. 31. Single and Double-Strand DNA Breaks: In pioneering work a University of Washington team found DNA single strand breaks from RF radiation exposures on rats in an initial study. A subsequent study found single and double-strand DNA breaks. 32. Various Genetic Effects: An Austrian study analyzed the results of 101 different published articles on the effects of radio frequency EMFs on DNA. The study concluded that, “there is ample evidence that RF-EMF can alter the genetic material of exposed cells“. 33. Increased Rates of Micronuclei: Micronuclei proliferation indicates a type of DNA damage strongly associated with cancer.A Brazilian study found that, “electromagnetic field irradiation [low level cell phone type exposures] during pregnancy leads to an increase in erythrocytes micronuclei incidence in rat offspring“. Several studies have found increased rates of micronuclei in the body following exposures to RF radiation. 34. Heat Shock Proteins (HSPs) Production Decreased: A U.S. study exposed chick embryo’s to RF radiation. 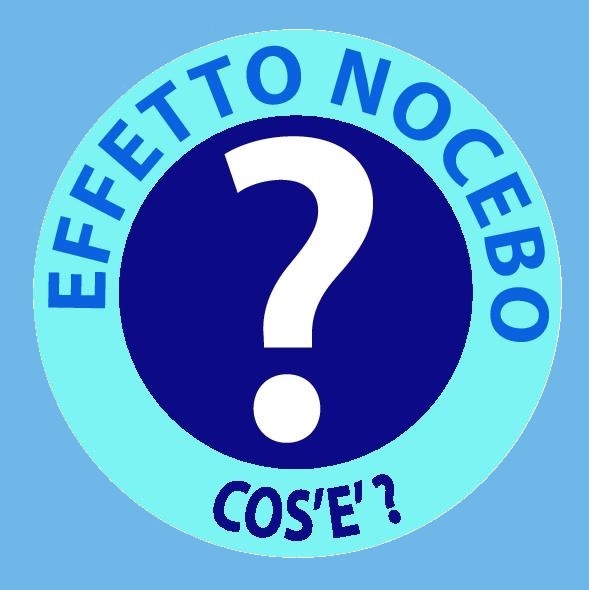 They concluded that, “this EMF-induced decrease in HSP70 levels and resulting decline in cytoprotection suggests a mechanism by which daily exposure (such as might be experienced by mobile phone users) could enhance the probability of cancer and other diseases“. 35. Oxidative DNA Damage: the Guler study in Turkey exposed female and male infant rabbits to 1800 MHz radio frequency radiation and found, “GSM-like RF radiation may induce biochemical changes by increasing free radical attacks to structural biomolecules.” Free radical damage is associated with the development of cancer. 36. DNA Strand Breaks: this Austrian study exposed human and rat cells to mobile phone radiation and found, “DNA single- and double-strand breaks”. 37. Changes in Gene Expression: the Belyaev study found that, exposing the “rat brain to 915 MHz GSM microwaves induces changes in gene expression”. Other studies suggest that, “subtle changes of gene expression associated with [disease]”. 39. 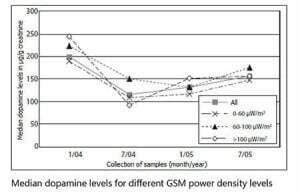 Neurotransmitters Impacted: this Bavarian study followed 60 people over one and a half years following the installation of a new cell phone base station in their village. The study concluded that, “the effects showed a dose-response relationship“, that it had “occurred well below current limits for technical RF radiation exposures” and that these effects have “great relevance for health and [are] well known to damage human health in the long run“. In other words the more people were exposed to cell phone type radiation the bigger the impact on their health. 40. Chromosome Damage: a Belgian study reviewed 16 expert gene monitoring studies from around the world. In 13 of the 16 independent studies performed worldwide it was found that, “RF-exposed individuals have increased frequencies of genetic damage (e.g., chromosomal aberrations)“. The studies don’t tell all of the story. Here are some other things you need to know. 42. Latency Period Before Diagnosis: To put this in the words of researcher Dr. Martin Blank “cancers do not form overnight”. In almost all cases cancerous tumors take many years to form and metastasize” Dr. Martin Blank: Overpowered. 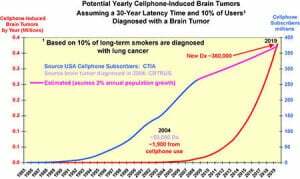 This would suggest that we might be sitting on a cell phone radiation cancer time bomb. 44. Flawed Research: Not all of the research points to a link between cell phone radiation and cancer. But then that’s hardly surprising given the lengths some researchers go to, to skew the results. This research paper also lays bare the phenomenon of study bias. This can take many different shapes and forms; insufficient latency time, incorrect definition of “regular” cellphone user, cell phones radiating higher power levels in rural areas not investigated, exposure to other transmitting sources not considered, exclusion of brain tumor cases due to death or illness, etc. There is lot of interest surrounding the link between cell phone radiation and cancer. But cancer is only the tip of the iceberg.